There are many steps you can take to improve your diet and reduce your food expenditure. 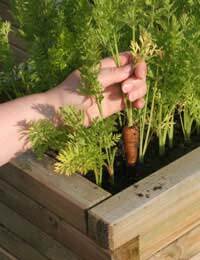 If you have somewhere to plant a small vegetable garden or just an area in which you can put some container grown plants, you can actually grow some of the more expensive herbs, fruit and – above all – vegetables. Growing from seed can slash your expenditure on produce like peas, tomatoes, cucumbers and strawberries, all of which can be planted in pots. If you have a windowsill you can grow peppers, basil and chives and if you have a small area of ground to plant in, you can grow your own runner or French beans, lettuce and spinach. You can grow rhubarb in a bucket, blueberries in a pretty tub, and window boxes look lovely with alpine strawberries in them. This isn’t just cheaper food, it’s also healthier food, as you can be sure that it doesn’t have pesticides and herbicides all over it. And it’s also fresher – you can be eating your harvest within a minute of picking it from the plant. You should be eating 3 – 5 servings of vegetables a day and 2 – 4 servings of fruit, so the more of this part of the food pyramid you can produce at home, the more money you have to spend on other parts of a healthy diet that you can’t grow yourself. Plan your meals around seasonal food. In summer, when they are cheap, buy tomatoes, courgettes and aubergines and freeze them for use in winter when they will still have the taste of summer and you won’t have to pay over the odds for them. In winter, cook hearty stews using the cheaper root vegetables that are readily available. Cooking apples are cheap in the autumn but hugely expensive in spring. Buy them when they are reasonably priced and cook them to a pulp. Freeze them with hedgerow harvested blackberries that you have washed and dried and you will have containers of lovely blackberry and apple filling for pies or bases for crumbles, throughout the year. Cereals can be a cheap and healthy way of extending your diet into new areas. Instead of simply eating pastry, pasta and pizza, try some of the more unusual options that are still very cost effective: couscous takes only minutes to prepare and is lovely with a curry; wild rice mixed with the cheaper white rice gives a nutty taste and a more satisfying chewy texture. Don’t be too adventurous. While we all want to try new things, you should consider your family’s preferences when planning novel menus. They have favourite meals which they are happy to eat, while new dishes may end up in the bin. Try only one new recipe a week, in amongst those old favourites and think about how you might re-use it if it isn’t a success: meats can be minced and turned into rissoles, for example, so that a new dish that isn’t popular doesn’t have to be entirely wasted. Leftovers are important to your healthy food pyramid. Any food not eaten at one meal can then be used in a later meal, as long as you have stored it safely. Leftover pasta can make a great lunchbox treat, while roast meats can be used in casseroles or soups or sandwiches. Leftover vegetables can be mixed with high quality stock and pureed to make a healthy soup.